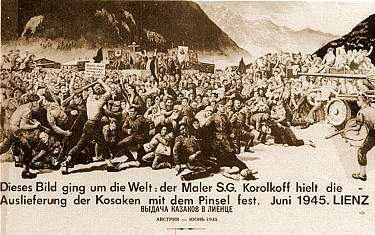 This image is a black and white version of “The Betrayal of the Cossacks at Lienz” by S.G. Korolkoff, with a German inscription. The Rutland Herald has a very interesting article about the 60th anniversary of the Massacre of the Cossacks at the end of World War II, by the British and Soviets. It mentions Fr. Michael Protopopov as speaking and serving the memorial service that took place. I got to meet Fr. Michael when I went to Australia in December of 2000. I think he got almost as much a kick out of meeting a cowboy boot wearing Deacon (at that time) from Texas (with my accompanying mannerism and manner of speaking) who had converted to Orthodoxy from Protestantism, as I did out of meeting a Russian Priest from an aristocratic Russian family, knighted by the Queen of England, with an Australian accent, a great sense of humor, an incredible sense of history, a deeply rooted and balanced Orthodox spirituality, and a jolly disposition. I enjoyed listening to him in particular, and he and the other Aussies apparently enjoyed listening to me. They kept asking me to repeat certain phrases, and then laughing. Some phrases, I could figure out why (like when I used the phrase "chewing buddy" to refer to a close friend), but other phrases I couldn't see the humor of... but they did. I was fortunate enough to get to spend time with Fr. Michael again at a clergy conference in New York in 2003. As I recall, he wrote a book about the Massacre at Lienz, and "Operation Keel Haul". It is amazing how many dark chapters of history, such as this, are almost completely unknown to the vast majority of people. You can see pictures of the service that took place, as well as the monument in Lienz by clicking here. If you wondered why the Supreme Court split hairs over displays of the Ten Commandments, and didn't ban all of them in public buildings, it probably had something to do with the extensive redecorating that they would need to do in their own Court House... not to mention the rest of Washington, D.C.
See this article in Human Events for a number of photos of the 10 Commandments on Display at the Supreme Court Building, and in other federal buildings. Click here, for another image of the U.S. District Court's display of the Ten Commandments. I would suggest every court building in the united states should incorporate the exact same images of the 10 commandments that are found in the Supreme Court Building, and see what they have to say next. I also think it's great that someone is trying to seize Justice Souters home on the basis of the the court decision that he signed onto this week. These liberal justices should be impeached. We need to take back our country from judicial tyrants. After almost 80 years of alienation, resulting from the machinations of the Soviets and its attempt to utter destroy the Church, the division between the Orthodox Church in Russia (aka the Moscow Patriarchate) and the Russian Orthodox Church Outside of Russia is coming to an end. Just this week, mutually agreed upon documents were published on the official web site of both Churches (in English and Russian), and so the final steps in the process of reconciliation are now under way. 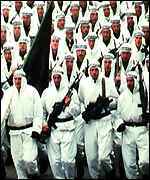 FrontPage Mag has an article by Julia and Lev Gorin that is well worth the reading, on video tapes recently sent to the Hague about atrocities in the Bosnian War. Speaking of interesting songs, this song is considered Australia's national song. When I visited Australia in December of 2000, I was introduced to it at a Russian Orthodox Youth Conference in Western Australia. They sang this song with a lot of gusto, and it had a catchy Irish sounding tune, but the words didn't make much sense to me at the time. If you have ever seen the movie "On The Beach" with Gregory Peck, you would have heard it throughout the movie (which is about an American Nuclear Sub that goes to Australia after a nuclear war between the Soviet Union and the United States, only to watch everyone eventually die off from the radiation). There is an entire web site dedicated to this song, and it has several sound files you can listen to, if you have never heard it before. So the poem (doggerel? folk song?) can be interpreted as yet another Aussie complaint about them in authority. We're one of the most urbanised nations in the world, who sort-of yearn for the wide open spaces (there's so much of it out there! ), and the freedom that goes with it (or at least seems to go with it, to those that don't live there). So Waltzing Matilda strikes a chord (so to speak), generation after generation, for the same reason that Crocodile Dundee was as popular here as anywhere else - we know we're not like that; but it's fun pretending for a while that we are. Note: These are my own explanations and interpretations, checked against the Macquarie Dictionary; except for the origins of the term to 'waltz matilda', which, like most Australians, I didn't know until I looked it up. Another Note: The only one of these words that's basically died out of Australian english is 'jumbuck', although 'troopers' is a bit dated, and 'waltzing matilda' only survives because of this song. An Aside: When the trooper says "where's that jolly jumbuck you've got in your tuckerbag? ", he seems like a right galah (twit, twerp, nerd/nurd, fool), asking a question he's already declared he knows the answer to. Actually, it's quite sensible, because, at least in Australian english, you say it with your hand extended expectantly, and it means "give it back!". There's lots of examples of such perversity in the language, derivative, I reckon, from the significant Irish element in early Australia (ever wondered why a redhead's called 'blue'?). A Final Aside: Many non-Australians assume that the cute-sounding place-names and other words in Australian english are from the Aboriginal language. In fact, there were hundreds of aboriginal languages, and many language families largely unrelated to one another. An illustration of the confusions that this has led to relates to the 'kangaroo'. The word was brought back to Britain by Captain Cook in 1770, along with the first drawings of the animal. He had heard it used by North Queensland aboriginals during one of his landings up there. When the first white settlement was established at Sydney in 1788, over 2,000 kilometers south of Cook's landing, the local aboriginals heard the white men referring to the animal as 'kangaroo', and assumed it was the white man's name for the thing. I wonder if anyone knows what it was called in the language of the local tribe on the shores of Sydney Harbour (the Dhurag - spelt whichever way you like, because they had no written language, and are long since extinct). The sailors, marines and convicts didn't have an anthropologist with them at the time, let alone a linguistics professor. Michelle Malkin on Rosie O'Donnell's reaction to the bonding that was occuring with her "partner" when she was breastfeeding her baby, before she demanded it be stopped. Howard Dean rages against Republicans, who all look alike, and are all white Christians (This from a man who grew up on Park Avenue, and was governor of the whitest state in America).